"Prescient and quick....A perfect fusing of subject and writer, idea and ideal." "Extraordinary...hilarious...Elegantly written, Rooney creates a glorious paean to a distant literary life and time—and an unabashed celebration of human connections that bridge past and future. "Rooney's delectably theatrical fictionalization is laced with strands of tart poetry and emulates the dark sparkle of Dorothy Parker, Edna St. Vincent Millay, and Truman Capote. Effervescent with verve, wit, and heart, Rooney's nimble novel celebrates insouciance, creativity, chance, and valor." 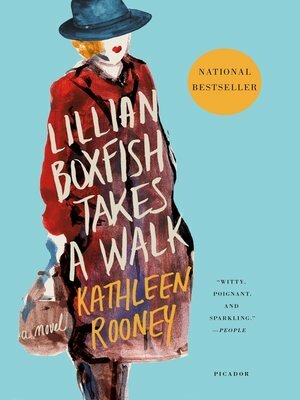 "In my reckless and undiscouraged youth," Lillian Boxfish writes, "I worked in a walnut-paneled office thirteen floors above West Thirty-Fifth Street..."
She took 1930s New York by storm, working her way up writing copy for R.H. Macy's to become the highest paid advertising woman in the country. It was a job that, she says, "in some ways saved my life, and in other ways ruined it." Now it's the last night of 1984 and Lillian, 85 years old but just as sharp and savvy as ever, is on her way to a party. It's chilly enough out for her mink coat and Manhattan is grittier now—her son keeps warning her about a subway vigilante on the prowl—but the quick-tongued poetess has never been one to scare easily. On a walk that takes her over 10 miles around the city, she meets bartenders, bodega clerks, security guards, criminals, children, parents, and parents-to-be, while reviewing a life of excitement and adversity, passion and heartbreak, illuminating all the ways New York has changed—and has not.